the tribune, consul, and commander in chief by the senate and stated that he would keep these titles for his entire life. He gave himself the name Augustus or majestic one. Augustus started the creation of a new state called the Roman Empire, although he said he supported the republic. His foundation of the Roman Empire made him the first emperor of Rome. Augustus ruled as emperor for 40 years. He had may great accomplishments that allowed Rome to continue its success. He was a large contributor to the arts. He no longer allowed the exploitation of the provinces and turned tax collectors into government employees. When wanting all Romans to be well fed, he started to import grain from Africa. Augustus also constructed new roads and public buildings. "I found Rome a city of brick and left it a city of marble," was a famous quote spoken by Augustus boasting about his changes to the city. He marked the start of the Pax Romana or Roman Peace, which lasted for 200 years. His thoughtfully chosen successors allowed Rome to flourish, although he set no guidelines for future rulers. 1) This picture shows Augustus's military leadership. 2) This picture represents his efforts to improve Roman architecture. 3) This picture shows his endorsements of the arts. 4) Augustus built many of the Roman roads. 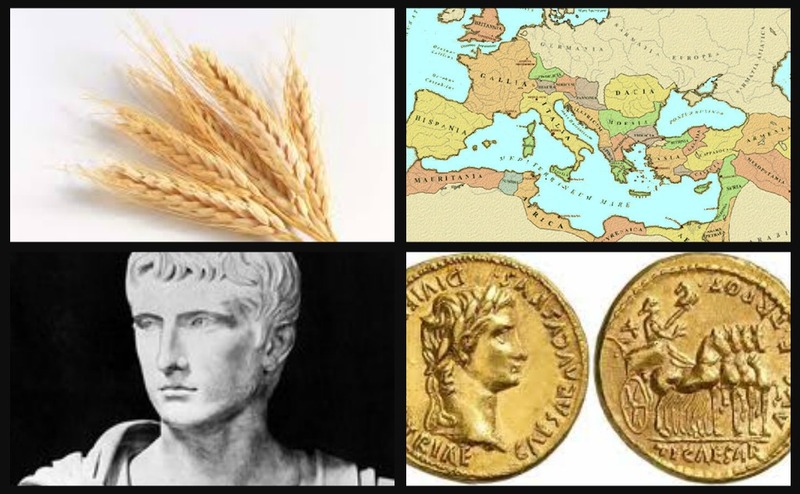 1) Augustus wanted to import grain from Africa so all could be fed. 2) He tried to created better conditions in the provinces. 3) He was the first emperor of Rome. 4) Augustus helped improve the economic standings of Rome.